When my husband Jay and I were dating, we had the first great adventure of our lives together, a twelve day rafting trip through the Grand Canyon, an improbable adventure for two middle-aged people who had never rafted before. Jay had never camped before either—except when he was in the army. And he hadn’t liked it. It had come about by accident. George, a geology professor at Union College where I worked, spotted my friend Sigrid and me buying lunch. Apparently we looked especially gullible that day. He was planning another trip through the Grand Canyon—he’d made umpteen trips already—but was looking for a way to finance it. That’s where we came in. If he could inspire a few colleagues to become fellow adventurers—and if he rowed the supply raft—he could travel for free. We said we’d think about it. After all, it was a year and a half away. In the end, ten people had a Union connection, half the people on the trip: John, an engineer; Dave, a chemist, and his wife and teenage sons; Sigrid, who taught German; George the geologist and his daughter; and Jay and me. We women had our worries, mainly about how we would go to the bathroom and about sudden death. George, the geologist, assured us that everything was easy, safe, and great fun. We’d love it. Dave, the chemist, had done the trip once before. Before the trip, we had to buy stuff, all indestructible, most of which I’d never owned before: water bottles, river shorts, Teva sandals, kerchief, flashlights (preferably the kind that attached to one’s forehead), dangling things you hang from your glasses so they don’t fly into the river, carabiners so your water bottles and other belongings don’t fall into the river either, a sunhat with a flap on the back that makes everyone look dorky. We clipped our hats to our tee shirts, so—I have a theme going here—they didn’t fall into the river either. We met the guides and the other members of our group at Lees Ferry, just down river from the Glen Canyon Dam. The river flowed gently enough with little hint of the drama we’d face ahead. All the guides loved the canyon and the river, hated dams that changed the environment, hated the motorized rafts (so did we), and hated people who didn’t respect and take care of the river. Most on our trip were women: tough, crude, gutsy, funny, and smart. They peed standing up; I hadn’t known it was possible. The guides gave us little metal boxes to store the things we’d need during the day and two big, heavy black rubber bags each, one for a sleeping bag and ground cover, one for our clothes and other personal belongings we’d need when we camped each night on shore. They showed us how to wear our life jackets and assured us that they would prove utterly necessary for survival. Our bags were stowed in various rafts, many on the one that our Union colleague George would be rowing. If we didn’t roll the bag tightly, properly, they warned, our things would get wet if the raft carrying it overturned. When George’s raft went sideways, backwards, and upside down through one of the monster rapids, it turns out I had not packed one of my black bags carefully enough. Everything inside was soaked with muddy Colorado River water. My camera and my shrink-wrapped tins of curiously strong mints were destroyed. I spread everything else, including my underwear, on big rocks at our next evening stopping place. Twelve days and not one man shaved. In fact, all were all darned proud of their scruffiness. None of the women brought lipstick. We did nothing with our hair except comb it down in the morning. We were not a stylish lot. We crouched in the river in the morning and washed as quickly as we could in the cold water, craving only a smidgen of privacy and warmer water. Once or twice, in the warmer shallow water of a tributary, we poured water over each other, shampooing our hair gleefully. Jay was the oldest person on the trip. To my pleasant surprise, since we hadn’t yet traveled together, he was a trooper. It was he, not I, who took the oars going through one of the rapids, small rapids, but rapids to be sure. At sixty-five he had more reason to be concerned about the exertion and the heat. And he had to make more trips than most to the river in the dark of the night. (It was on one of those middle of the night trips that he injured his leg and got the infection—but he was ok, eventually, a few weeks after we got home.) Jay was facing surgery for prostate cancer after the trip, and he was determined to enjoy every minute of our adventure. We became part of a different world of deep cold river and hot canyon walls. We swam in pools in the streams that flowed into the river and slid on rocks behind waterfalls. We hiked up canyon trails that scared me half to death. I hadn’t known I was afraid of heights until I stood at the edge of dizzy-making, rocky precipices overlooking the river below. Once Matt, one of the guides, had to take my hand and talk gently or I would have spent the rest of my life somewhere on a ledge jutting precariously near the river and the jagged rocks. The teenagers on our trip scrambled up and down as if born to the life. Twelve days on the water. Twelve days to float past mile high, ever changing canyon walls, punctuated by brief, laugh-out-loud, oh-my-god thrills of unimaginable drops of twenty-five feet and more into churning water. 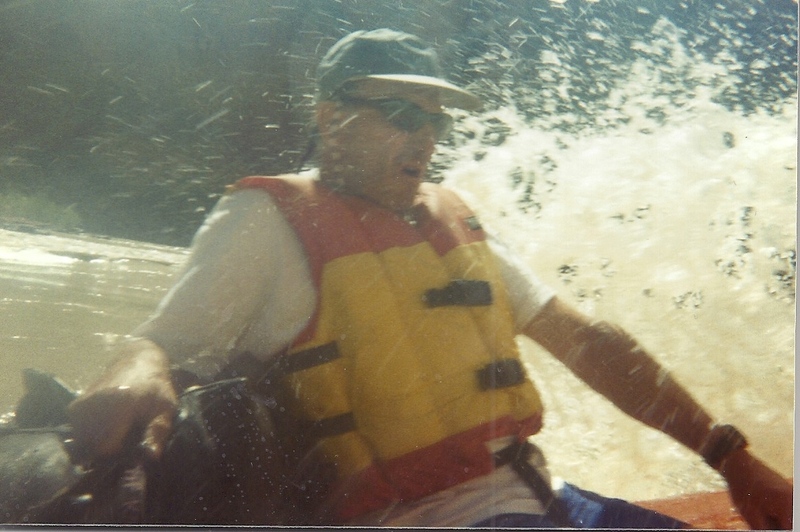 Once I found my body stretched out in the rapids in the Colorado River, my only connection to the raft my fingers clutching the rope that circled the top. I had made a resolution that if the raft remained right side up, I would remain attached to it. In calmer waters, Matt, the same guide who talked me down the canyon trail, taught me how to yell out loud. Yee haw doesn’t come easily to me. He called on me to perform at our farewell get-together, and in my opinion, I did well. I may have forgotten how, one gets rusty. If you ask, I’ll say no. At night we’d scramble onshore, drag up the rafts, help unload the supplies and search out soft sandy spots for our sleeping bags. Once while we were setting up camp, a small rattlesnake slithered three or four feet from the head of my sleeping bag, the second snake we’d seen in five minutes. “Don’t worry. They’re not aggressive; they won’t hurt you,” the guides assured me, too quickly. But other nights I slept under the stars, a zillion stars hanging in the sky between the dark canyon walls while below, benign shadowy bats darted above our heads. Each morning a guide would walk around our camp, yelling that it was time to get up and drink coffee. By the time we had washed up a little, rolled up our sleeping bags and ground covers tightly enough to fit into our waterproof rubber bags, dressed in our shorts, tee sheet, Tevas, and sun hat, breakfast was ready. Lots of it, laid out on folding tables. Juices, fruit, eggs, french toast, pancakes, bacon, sausages. We piled our plates. I was amazed the rafts could carry enough food safely for a twelve day trip. George’s raft held the food cold below the water level. Lunch was usually make your own deli-style sandwiches. Salami and cheese and ham. Two or three kinds of bread. Fruit. Pasta salads. Cold drinks. Hearty cookies. My most memorable lunch was served on tables set in the middle of a shallow stream flowing into the Colorado River. We stood in the scorching sun, up to our knees in cool water. Dinner was salmon or chicken or steak or pork tenderloin. Once the guides cooked upside-down cakes in cast iron skillets over the grills. One night, after dinner ended with watermelon, and the guides had probably downed too many beers, they stuffed a watermelon with oily rags, set it on fire, and sent it down the Colorado river, a magnificent sight. We ended the trip on the Havasupai Indian Reservation, We pulled the rafts out of the water and helped load them onto the trucks that would carry them away. We were a mess. The cotton tee shirts we wore on the trip were never clean again, dyed brown from the sand in the river. Bedraggled though we were, we were presented with a feast of a brunch, fit for people far spiffier than us, brought down the canyon by other, cleaner rafting staff. Salads. Fruit. Cold cuts.. Cheeses. Pastries. Wine. All beautifully laid on tables with tablecloths and wonderfully free of sand. We had never seen such a meal or enjoyed a meal as much, the pleasure tinged bittersweet. These were the last moments of a mind-boggling, life-changing, and, for most of us, once-in-a-lifetime trip. We had come to feel intimately connected with our dirty fellow-adventurers. And this lovely meal was the last time we would break bread together beside the river. When we’d eaten our last fresh perfect strawberry, it would be time to climb into the four-wheeled vehicles and go back to motels in Flagstaff and then to our other lives. In Flagstaff, Jay and I took our clothes to the laundromat, washed them several times, and threw most away, too stained ever to wear again. We flew home happy with the trip and with each other. Jay’s leg healed. His cancer was successfully treated. And soon after, we married, confident that this would not be our last happy adventure together.